New beginners generally join at the end of every 2nd (odd) month! 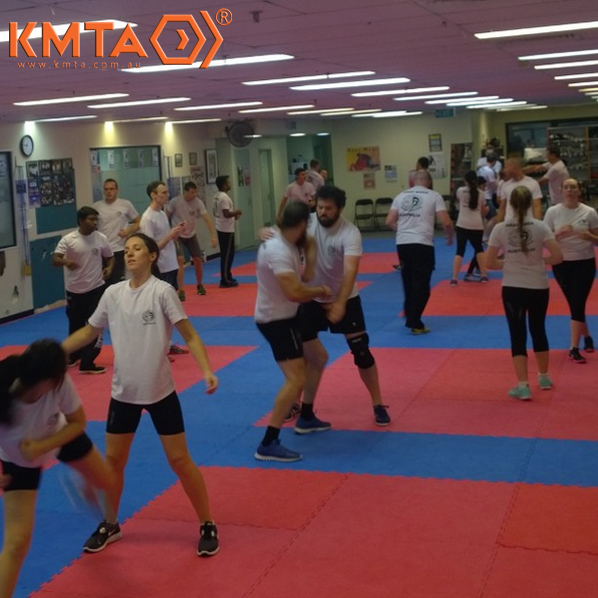 Our Saturday classes are designed for those who are unable to commit to regular evening sessions, but would still like to get training and exposure to Krav Maga! These classes are topic focused, not specifically goal-focused in the same way our evening classes are. However students who consistently train in the Saturday classes may get the opportunity to grade once or twice a year if they like. Grading is never compulsory. JOINING SATURDAY CLASSES: On the last Saturday of every second month (Jan, Mar, May, Jul, Sep) we hold a FREE introduction session of 2hrs to anyone who has not trained with us before. Participants must register in advance through our website on the link above. Students training in Saturday classes may transfer to regular evening or morning classes only at the start of a new term. FEES FOR SATURDAY CLASSES: Memberships for Saturday classes are totally separate to our regular evening classes. You can pay for a full calendar month in advance, or a 5-trip card. Saturday memberships do not permit cross training in any of our regular evening or morning sessions. However Saturday sessions are included in any of our regular class memberships at no extra charge to our regular class students who may want to just get more training time in. All memberships can be purchased through the KMTA Shop, and are due at the beginning of the calendar month.